A body of scientific evidence has spread a distinct, reverberating message: The health benefits of dietary antioxidants are well substantiated and worthy of the public’s attention. Nutrition professionals routinely recommend a high intake of antioxidants from food to encourage a wide variety of health outcomes, be it healthier skin, cancer prevention, improved immune function, or a reduced risk of heart disease. Scientists continue to examine antioxidants in research studies, uncovering more data that emphasize their importance in protecting people’s health. 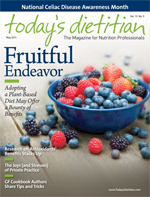 This article highlights some of the recent scientific support for antioxidants and the foods that contain them. In nature, antioxidants serve to protect living organisms from oxidative damage. When we consume foods rich in antioxidants, those benefits are believed to be conferred to us, thereby protecting the body’s cells. Just as oxidation causes a car to rust, the process can wreak havoc on the human body. Antioxidants are essentially scavengers of the damaging by-products of oxidation, otherwise known as free radicals. Marcia Costello, PhD, RD, LD, an assistant professor at Pennsylvania’s Villanova University College of Nursing, agrees that antioxidants play an important role in disease prevention and health promotion. “Vitamin C is essential for a healthy immune system, as it assists in protecting white blood cells from oxidation and helps prevent low-density lipoprotein [LDL] cholesterol from oxidation, which may reduce risk of cardiovascular disease [CVD]. As an antioxidant, it also reduces free radical damage in the lungs that may occur from exposure to environmental pollutants and cigarette smoke. There has also been research which has supported its role in cancer prevention,” she says. “Beta-carotene, the provitamin form of vitamin A, which is converted to the active form of the vitamin in the body, also boosts the immune system and reduces age-related changes in the skin and eyes by reducing ultraviolet light damage,” she explains. “Vitamin A is critical to healthy vision and the growth and differentiation of the body’s cells. The evidence on vitamin A’s role as an antioxidant is not as robust as beta-carotene, but it does appear to play some role in scavenging free radical damage, thus preventing some diseases. Looking beyond antioxidant-rich walnuts, pecans make a great snack and are a tasty addition to baked treats, and they may also boost the body’s antioxidant levels. A study published in January in the Journal of Nutrition reveals pecans’ potent antioxidant benefits. Researchers from the Loma Linda University School of Public Health found that bioactive components of pecan nuts (namely vitamin E) are absorbable and capable of positively affecting the body’s antioxidant defenses. The team examined postprandial effects of pecan test meals, including whole and blended pecans, on a group of 16 healthy male and female adults. Serum concentrations of y-tocopherol, a predominant form of vitamin E, reportedly doubled following the ingestion of whole and blended pecan meals, and Oxygen Radical Absorbance Capacity increased significantly. The consumption of whole pecans was positively associated with a decreased serum concentration of oxidized LDL cholesterol. As an abundant food source of the antioxidant selenium, Brazil nuts and their health benefits were the highlight of multiple studies in the past year. In one study, published in the November-December 2010 issue of Nutrition, Cominetti and colleagues from the University of São Paulo in Brazil analyzed the relationship between selenium status and oxidative stress levels in 37 women who were morbidly obese. Participants consumed one Brazil nut per day, providing approximately 290 mcg of the antioxidant selenium, for a period of eight weeks. The results showed that 100% of participants were selenium deficient at baseline and experienced increases in plasma selenium levels after daily Brazil nut supplementation. The findings suggest that the daily consumption of Brazil nuts can increase selenium status and increase GPx (glutathione peroxidase-1, an enzyme that protects the body from oxidative damage) activity in women who are obese. The blueberry has long been coveted for its high content of polyphenols, antioxidant compounds believed to enhance cardiovascular health. Polyphenols are found in various foods, such as cherries, raspberries, blackberries, broccoli, green tea, red wine, and dark chocolate. New research continues to hold the blueberry on its high pedestal. In the September 2010 issue of the Journal of Nutrition, researchers at Oklahoma State University published the study “Blueberries Decrease Cardiovascular Risk Factors in Obese Men and Women With Metabolic Syndrome.” The team sought to determine the effect of blueberry intake on 48 obese study participants with metabolic syndrome. Based on their findings, they concluded that blueberries may improve features associated with metabolic syndrome and the related risk factors for CVD at “dietary achievable doses”—in this case, the equivalent of 350 g of fresh blueberries daily for an eight-week period. Blueberry intake was associated with decreases in both systolic and diastolic blood pressure, oxidized LDL levels, and specific serum markers for oxidative stress. Another blueberry-focused study, “Bioactives in Blueberries Improve Insulin Sensitivity in Obese, Insulin-Resistant Men and Women,” published in the October 2010 issue of the Journal of Nutrition, aimed to evaluate the effect of dietary supplementation with bioactive compounds (notably polyphenols known as anthocyanins) from blueberries in 32 obese, nondiabetic, insulin-resistant adults. Stull and colleagues found that compared with the control group, the blueberry-supplemented group showed greater insulin sensitivity at the study’s conclusion. Based on a third study by Krikorian and colleagues from the University of Cincinnati Academic Health Center in Ohio, consuming blueberries may serve another important function: boosting memory function in older adults. Published in the April 2010 issue of the Journal of Agricultural and Food Chemistry, their preliminary study similarly focused on the health benefits of anthocyanins in blueberries, which have previously been associated with delayed neurological decline. After investigating the effect of daily consumption of wild blueberry juice over 12 weeks on a group of nine older adults with early stages of memory changes, they concluded that blueberry supplementation may indeed provide neurocognitive benefits. Several research studies published in the past year showcase the health benefits of lycopene from tomatoes, including the capability of this antioxidant to potentially inhibit cancer cell growth and enhance cardiovascular health. In the June 2010 issue of the American Journal of Clinical Nutrition, researchers from the French National Institute of Agronomical Research published a study aimed at differentiating the effects of consuming lycopene within a “tomato matrix” (from food) vs. purified lycopene extract. Looking at 30 healthy adult men between the ages of 50 and 70, they found that serum lycopene concentrations increased after the intake of red tomato paste and purified lycopene. Serum collections were then incubated to measure expression of 45 target genes of cancer prostatic cells. Results showed that dietary lycopene, whether in its purified form or within its food matrix, can affect gene expression and thus may protect against prostate cancer. Another study on tomato consumption by Shidfar and colleagues from the Tehran University of Medical Sciences in Iran, published in the December 2010 issue of the International Journal of Food Sciences and Nutrition, found that tomatoes may lower cardiovascular risk in people with type 2 diabetes. After providing 200 g of raw tomato daily to a sample of 32 adults with type 2 diabetes mellitus for a period of eight weeks, the researchers observed reductions in systolic and diastolic blood pressure and increases in apolipoprotein A-1. In the February issue of Clinical Nutrition, researchers from the University of Maastricht in the Netherlands reported on the potential health benefits of the antioxidant quercetin, a bioflavonoid found in many citrus fruits and leafy green vegetables. Their study, “Quercetin Reduces Markers of Oxidative Stress and Inflammation in Sarcoidosis,” a double-blind intervention on individuals with an inflammatory condition known as sarcoidosis, revealed that quercetin can increase the body’s total plasma antioxidant concentration. After supplementing quercetin, the researchers observed reduced markers of oxidative stress and inflammation among sarcoidosis patients, the effects of which appeared to be greater in those individuals with high levels of oxidative stress and inflammation at the start of the study. While flaxseeds are generally regarded for being rich in omega-3 fatty acids, their abundant lignan content should not be overlooked. Evidence has suggested that lignans may work wonders for our health—from lowering serum lipid and glucose concentrations and improving blood pressure levels to reducing risk of CVD by decreasing oxidative stress and inflammation. Lignans may inhibit cellular changes that lead to cancer and reduce cancer cell growth and metastasis. A study by Japanese researchers published in the June 2010 issue of Nutrition Research found that flaxseed lignans lower serum cholesterol and risk factors for liver disease in moderately hypercholesterolemic men. In a double-blind, randomized, placebo-controlled trial, the team assessed 30 men with moderately elevated total cholesterol levels (180 to 240 mg/dL). Among the subjects who were given 100 mg of flaxseed lignan capsules daily for 12 weeks, the researchers observed a statistically significant reduction in ratio of LDL to HDL cholesterol as well as lower levels of serum markers of liver damage. Overall, their findings indicate that daily flaxseed lignan supplementation can reduce blood cholesterol levels and lower risk of liver disease in this population. In many studies conducted over the past decade, the polyphenols in this traditional yellow-hued Indian spice have shown dramatic potential in terms of cancer protection. Curcumin’s ability to sensitize cancerous tumors, including cancers of the breast, colon, liver, and brain, to chemotherapeutic agents has been the focus of intense study. In the October 2010 issue of Nutrition and Cancer, researchers at Baylor University in Texas reviewed the golden spice’s anticancer benefits. They reported that the chemosensitization imparted by curcumin has been observed in numerous forms of cancer, including that of the breast, colon, bladder, prostate, head and neck, and brain, as well as conditions such as multiple myeloma, leukemia, and lymphoma. They note that curcumin may also sensitize tumors to gamma radiation. The team reported that in addition to acting as a chemosensitizer and radiosensitizer, curcumin has been shown to simultaneously protect normal, healthy organs from chemotherapy and radiotherapy toxicity. Costello also stresses the importance of choosing the right foods and preparing them in a way that minimizes vitamin damage from heat and light. “For example, when vegetable oils are heated, they lose much of their vitamin E content. Therefore, they are best consumed as a dressing or condiment. To preserve vitamin content, vegetables should be consumed raw or cooked using a method that reduces heat exposure, such as steaming or microwaving,” she explains. To add antioxidants to one’s daily diet, she recommends eating whole grain cereal at breakfast, snacking on an apple and a handful of almonds or sliced green peppers with hummus, enjoying fatty fish such as salmon or tuna twice per week, and using fresh garlic, herbs, and spices in cooking. The 2010 Dietary Guidelines recommend that people fill one-half of their plate with a variety of colorful fruits and vegetables, including dark-green, red, and orange vegetables. — Megan Tempest, RD, works at Presbyterian/St. Luke’s Medical Center in Denver and is a freelance writer.